A crane lowers the beginnings of an artificial oyster reef into the Severn River. On a cloudy Wednesday afternoon researchers from the Chesapeake Bay Foundation, the University of Maryland and the Naval Academy began creating a giant reef of 240 concrete balls caked with baby oysters, or spat. Doug Myers, a senior scientist with the Chesapeake Bay Foundation, explains the dead zones are the product of a process called stratification, where water currents of different temperatures settle atop one another, cutting off oxygen to the deepest parts and killing whatever lives down there. And oyster reefs, that once were a navigational hazard in the bay, helped break up the stratification. "So as tidal currents would normally pass over those, there would be lots of mixing top to bottom of the water," he said. "And in harvesting--overharvesting--all those reefs down to almost nothing, we don’t have that happening with the tides anymore." So, the scientists hope this two-foot tall artificial reef will create that mixing effect, thus increasing the dissolved oxygen levels. 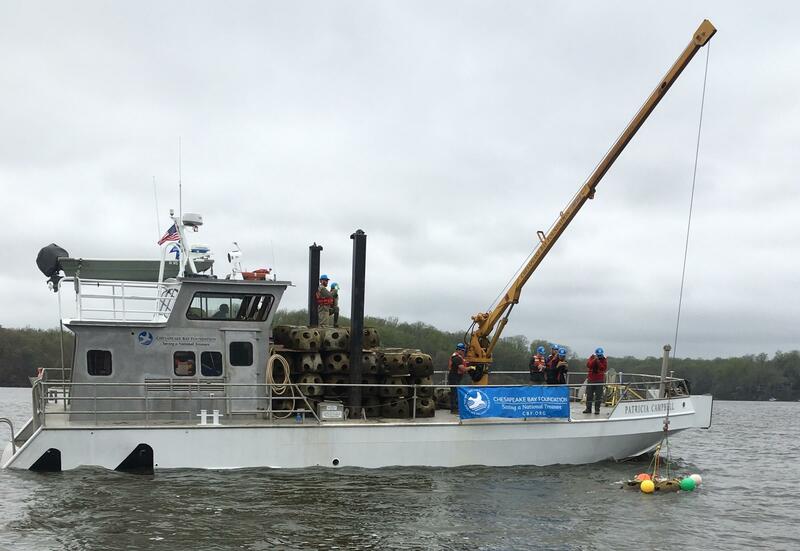 At the same time it will add 400,000 new oysters to the bay’s waters, contributing to the Chesapeake Oyster Alliance’s goal of adding 10 billion new oysters to the Bay by 2025. Each of the balls weighs about 250 pounds and was lowered by a crane from the Patricia Campbell, the bay foundation’s specially-outfitted research vessel. In a couple of weeks, the group will deploy the other half of the reef balls, along with monitoring equipment which will track oxygen levels and water currents. If they see an increase in the dissolved oxygen levels, they’ll know the reef is working. CBF Maryland Fisheries Scientist Allison Colden says the reef balls have been used for decades, but there’s not a lot of science on oyster reef balls, and nobody has used them to change water flows in this way. "The unique thing that we’re doing here today is we’re really examining the physical changes that these reef balls cause and the use of the reef to balls to try and improve water quality," she said. "So that’s really the unique part of this particular project." After the team collects measurements this summer, they plan to study the results on aquatic life. "What we hope to see that in the summer months after we complete this project, this area, which is usually devoid of fish and a lot of other life during the summertime because of the low oxygen, we hope to see those fish coming back," Colden said. "And then also, we’ll come back next fall and pull up some of these reef balls to see the oysters, see how well they’ve survived. And that’ll really be a response to whether or not it’s changing those water flows in the way that we think they are." In addition to filtering the water, oyster reefs provide numerous benefits, including food and habitat for other creatures, she says. "Oysters are sort of the cornerstone of all of that in terms of supporting the Chesapeake Bay ecosystem." Meanwhile, back on the dock, CBF Senior Naturalist John Page Williams, explained the economic motivations for improving the bay with projects like these. We’ll be thinking about that while waiting for the results to come in this summer.